Our solid understanding of distributed systems, security and embedded systems development on a variety of platforms (ARM, AVR and x86) make us an ideal partner for your next Industrial or IoT project. TWINT is the mobile payment solution of the leading Swiss banks. At the point of sale, a Bluetooth Low Energy (BLE) beacon is used to accept payments from smartphones. We developed an automated testbed that performs functional and stress tests on the beacon hardware and serves as a quality gate for beacon firmware development. 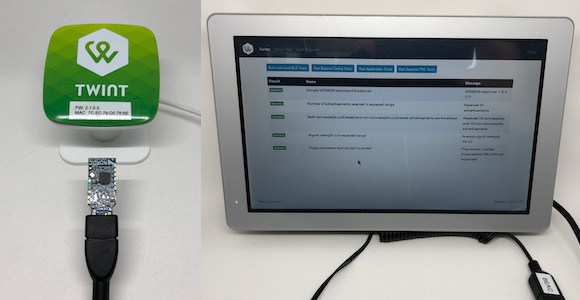 The testbed consists of a panel PC connected to the beacon (BLE Peripheral) via USB, and an nRF51-based dongle which emulates a smartphone (BLE Central). Latest technologies such as .NET Core and Angular were used to develop the testbed. The firmware for the nRF51 dongle was written in C using the nRF SDK. The architecture of the testbed is modular and extensible. For us the Internet of Things is not something intangible or a buzzword, just a convergence of trends like miniaturization and ubiquitous internet connectivity. Similar to the cloud being someone else's server, IoT solutions are mostly embedded projects that place high value on connectivity, efficiency and security. Talk to us, we'd love to see what you're building.